The robot is hot…until she puts on her short-haired wig. This was one of my thoughts after seeing Ex Machina. See, I’m generally not a short hair fan on women. And exactly therein lies the triumph of Ex Machina. Ex Machina adds significantly to the genre in movies and literature of the human pursuit of artificial intelligence (A.I.). It is at the same time cerebral and visceral. Cerebral in that it is a close scientific examination of the attempt to create A.I. – one that is indistinguishable from human intelligence and consciousness. The movie explores one man’s creation, and another man’s testing of that creation. Why it works so well is that it hits the tester (and movie viewer) in both the mind, and even more importantly, in the viscera. The tested program is in a futuristic, elegantly designed female robot form. A form that is very clearly a robot, and yet, has all the visual cues intended to target the id of the tester (and movie viewer). As successful as the A.I. may or may not have appeared to the tester of the A.I., a similar suspension of disbelief happens to the viewer. My reaction, the robot is hot…until…, is a testament to the art of the film and its insightful exploration of the human experience. Ex Machina is worth your time and thought. 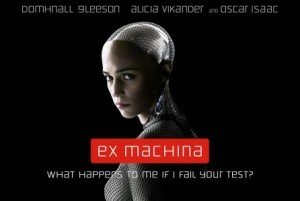 This entry was posted in SEEN and tagged Ex machina, Movie, Seen on May 21, 2015 by BrothersGeekadmin. “May the Fourth be with you”. Discussed:We reflect on a year of recording the podcast. It’s schmaltzy, which is appropriate. We all saw “Avengers: Age of Ultron” at least once. A spirited discussion ensues. We try and avoid hurting each others feelings. Andrew reads “Dune”; it’s a slog right now but admits Herbert’s artistry is unquestionable. Patrick falls short on completing “Batman: Eternal”. He re-commits. Again. Christopher sings an aria about “Rat Queens”, a brilliant new comic book, recommended by our friends at Samurai Comics. He convinces us all to read it. Christopher downloads “Hearthstone” for the Galaxy Note and continues to play a seasonal character on “Diablo”. His monk is leveled to 69 and has done so slowly. Andrew has a new Iphone6 and now can download mobile games again. He plays “Fruit Ninja”. So simple and so satisfying. Patrick recommends “Galaxy of Fire 2” as a mobile game. Patrick plays Movie Trivia at Hollywood Theater in Portland. He placed 5th as a team of 1 out of hundreds of people who attended. He also played “House on the Hill” with his Partners in Crime. It continues to be fun and engaging. Name the titles of the six Star Wars feature films, the years they were released, and the directors of each film. The Boys get partial achievements. Chris is aged enough to recall the original triologies release years. 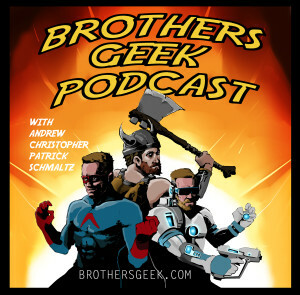 This entry was posted in Podcasts and tagged Avengers, Avengers Age of Ultron, Penny Dredful, Rat Queens on May 8, 2015 by BrothersGeekadmin.